The Secret Harbour on Peel Island looks south over Coniston Water to the hills of Cumbria. It has to be one of my favourite places on Earth. Bringing a small dinghy in there gives you a special feeling either of exploration or of coming home. You need to go when no one else is about. On the 1st June 1973 we spent a whole day filming there with a crew of sixty or more people. It was still a magical place. Our secret of Secret Harbour was that although many of the scenes in Arthur Ransome’s story arfe set there at night, back in 1973 we only ever filmed them during the day. This was achieved by using the technique of Day-Night, or Day-for-Night filming, the use of filters over the camera lens so that we could film a scene that would come across as being dark even though it was shot in broad daylight. This had obvious advantages. Filming at night is amazing, but very tiring. It demands considerable lighting set ups, which would have been impossible on Peel Island as they could not get a generator out there. The sun wouldn’t have set until very late on 1st June in the Lake District where mid-summer nights are short. Children are only permitted to work certain hours and need to be given rest days afterwards, so filming exteriors at night just wasn’t feasible. And yet, much of Swallows and Amazons, including the most dramatic of scenes, is set at night. 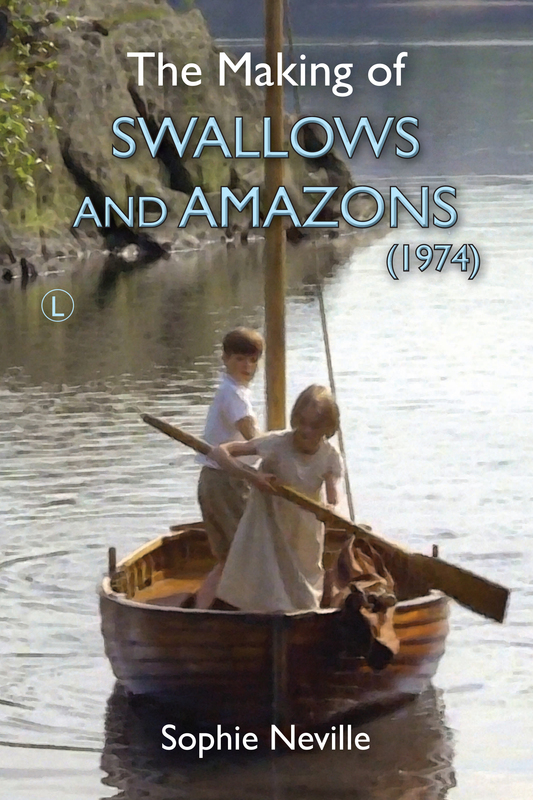 I remember Claude Whatham, the Director of the film ‘Swallows & Amazons’ (1974) and Dennis Lewiston, our Lighting Cameraman or Director of Photography, being intensely absorbed in perfecting our Day-for-Night sequences. This was particularly tricky for them as many were set out on the water. Having already shot one night scene on Peel Island when we were in the girls’ tent, Dennis now started the day with a scene which was set on the island, yet looked out over the water. He explained that ideally he needed constant, bright sunlight, which would look like moonlight reflected on the ripples of the water. What he didn’t like were cloud banks. And for this we would wait. And waiting for children, while out on the water or in a confided space can be hard. In the scene where the Swallows set up the leading lights Dennis accepted the clouds. It looks fine, as it’s appropriate for it to be getting dark. The little fluffy clouds in the scene where the Amazons arrive aren’t so great as they landed on Wild Cat Island in the dead of night. Even on land the Day-for-Night shots would take some time to line up. The candle lanterns had to be boosted with battery operated light bulbs. If you look at the lantern in Susan’s tent you can see a black electric wire coming off it, and even a bulb on the Big Screen. You don’t notice this because your attention is on the dialogue but it can easily be spotted. You might think it would be a distraction for us children but we were all quite down-to-earth and the technical detail kept our interest and our minds on our work. These were our favourite scenes, set in our favourite place. It was the Amazons’ big day with Kit Seymour emanating leadership as she portrayed Nancy Blackett ‘terror of the seas’, with all the confidence, grace and rugged beauty Arthur Ransome must have either known or envisaged. ‘By Gum, Able-seaman – I wish you were on my crew.’ There was much dialogue for Lesley Bennett who played Peggy. She did well, but acting opposite Suzanna Hamilton is always easy. It’s like rowing in a crew led my an excellent stroke or having a good man at the helm. The part of the practical Susan was not a charismatic one but Suzanna anchored us all. Her own performance is absolutely faultless. I had much to react to but not much to say. I did manage to handle the Amazon by myself and the long shot when I captured her was achieved in one take. A triumph at the end of a long day.